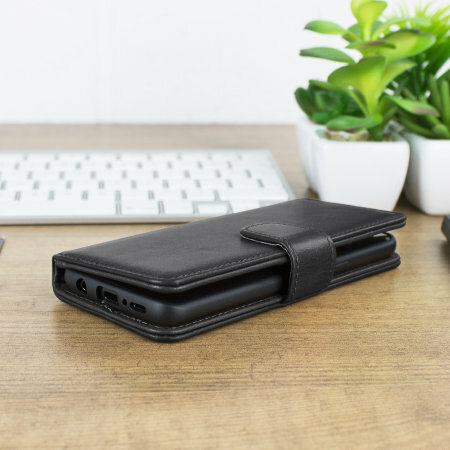 The genuine leather wallet case from Olixar offers perfect protection for your Samsung Galaxy S9. Featuring premium stitch finishing, as well as featuring slots for your cards, cash and documents. 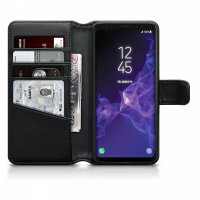 Secure your precious Samsung Galaxy S9 in a distinctive 100% genuine soft grain leather wallet case. 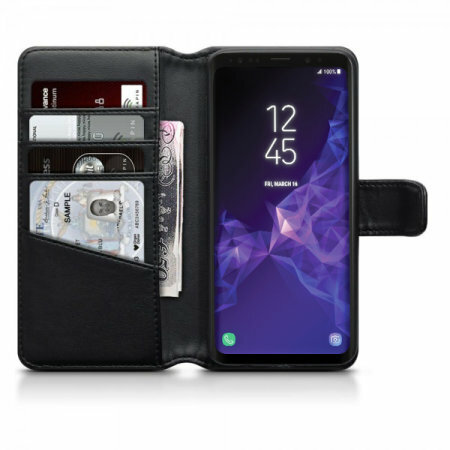 The Olixar Genuine Leather Samsung Galaxy S9 Wallet Case is perfect for use in any professional situation - leaving no doubt as to its quality. Ensure your Galaxy S9 is safe, protected and still highly visible. Simply place your device into the frame for a secure hold, allowing for easy access to your phone. 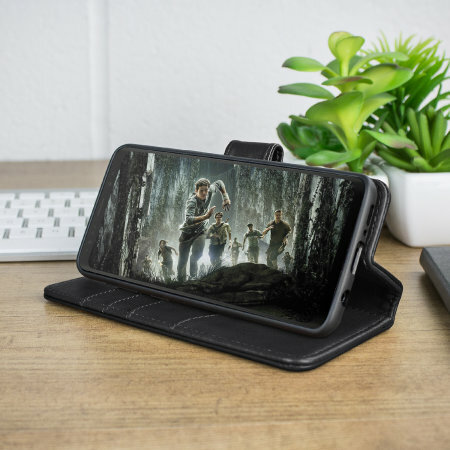 Featuring 100% genuine soft grain leather, this lightweight yet sturdy case from Olixar keeps your Samsung Galaxy S9 safe and secure with a professional look that is designed to impress as well as be completely practical. By using slim, attractive soft grain leather, your phone will slip easily in and out of your pocket or bag. The casing will age beautifully and only improve with time, as all good leather goods should. The Olixar genuine leather wallet case features attractive stitching around the exterior contours, providing a premium executive finish. 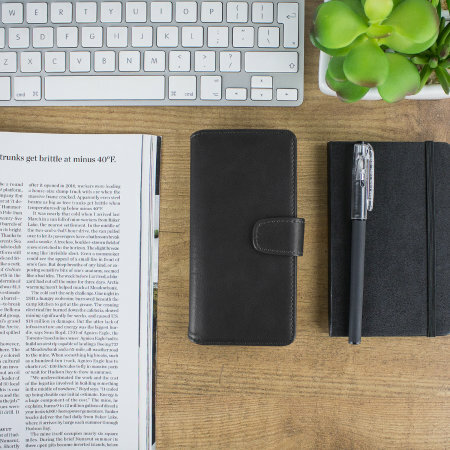 Added to the beautiful soft touch real leather, you will experience a product of recognisable quality designed to last while drawing a great deal of admiration from family, friends and work colleagues. This thoughtful design features inner slot pouches specially designed to hold credit cards, cash, store cards, a driving licence or anything else of a similar size. 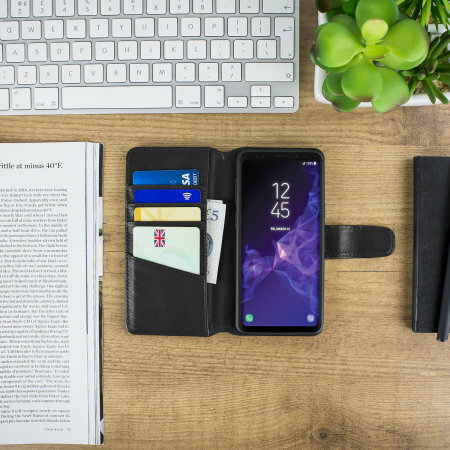 So leave your old wallet at home and instead use the Olixar Genuine Leather Wallet Case for the Galaxy S9. Perfect for the everyday commuter, holiday maker or business professional alike. 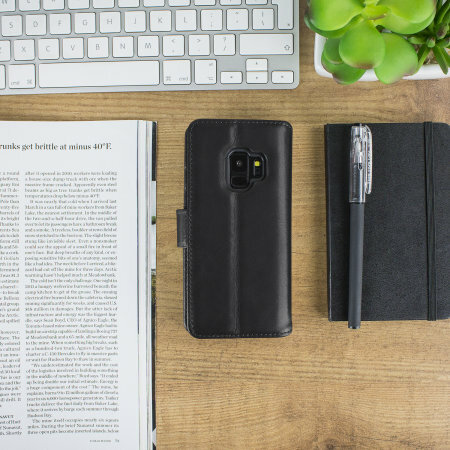 As this beautiful genuine leather case is designed specifically for the Samsung Galaxy S9, you can be sure of a perfect and secure fit for your device with cut-outs and access to all of your phone's features.